Just got this weeks Motorcycle News, ( MCN ) and we are in it, pages 38 and 39. 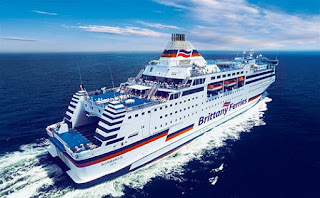 A feature on the trip we did to Normandy in April 2013. I will be getting a clearer version in a couple of days and will post that as well. WHY ? Normandy, well well over ten years ago I was invited to go over to Normandy with a group of friends to have a look at the World War Two sites and we stopped at Normandy Beach Bed and Breakfast in Arromanches Les Bains. A some what quaint place with an armoured car in the court yard and pop up gazebos for the motorcycles. 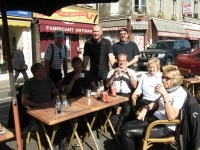 A lot of things have changed since those early days..
After the legendary breakfast we would head out onto the Normandy roads taking in the sites and also take in some nice roads, in between breaks for drinks, non alcoholic, when riding. This went on for a few years until I had a though about bringing over a small group of motorcyclists, just to do the roads and add a bit of advanced tuition at the same time. So in around 2008 we started the Advanced Workshops and every year have made changes and developed the courses. This brings us up to date with our April 2013 trip, which has now been and gone.